cancellation need to be notify the property 10 days before arrival, or your booking will be canceled automatically if you failed to contact the property for confirm the booking. 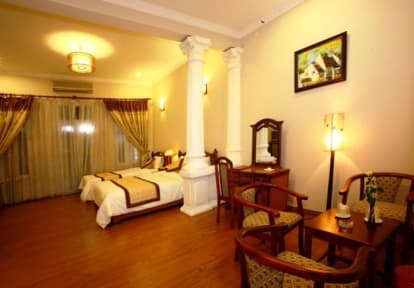 Ideally situated in the heart of Ha Noi's Old Quarter and surrounded by bustling shopping ancient streets. 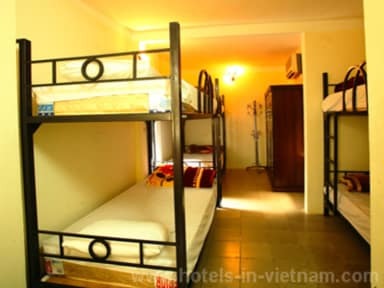 Bodega hostel is one of the most beautiful and luxurious hostel in the center of Ha Noi capital. Next to it is the crowded and romantic Hoan Kiem lake, which makes it perfect choice for both business or leisure tourist. Presently, we are delighted to provide any tour informations in the all regions of Viet Nam, beside that we could offer many different packaged tours from the north to the south. Especially, the private or group tours to Ha Long and Sa Pa are available everyday with the best quality and the most competitive price. * We also can arrange a visa to Lao or Cambodia and extend your Vietnamese visa. * We have the ability to book the air/ train tickets to Lao, Cambodia and other famous domestic locations, such as Hue, Hoi An, Nha Trang, Da Lat, Mui Ne, Sai Gon and of course you can travel there by open bus. * In order to satisfy your needs when staying in Viet Nam , we possess several different motorbikes, bicycles and cars for rent. After a pleasant day of touring, you may feel a little bit tired, so you will be served a cup of refreshing tea or coffee free of charge. Please come to discover our moto: BODEGA HOSTEL, YOUR FAMILY IN VIET NAM? We guarantee that the mentioned-above slogan will reflect our real services. Free: Fresh fruite in your room. Good stay nice staff helpful. Ya get what ya pay for so don't spend your time complaining about what you didn't receive for $15 a night. The hotel is good value for your money. Although outdated in style/facilities, should you book a private room, you get a decent sized space with a double bed and ensuite that costs less than to share at most hostels in Europe. The only real downside to my experience was my neighbours. They were loud and did not stop until about 2-2:30am for the 2 nights I stayed in the hotel. Our rooms were behind the lobby so I was surprised that the hotel staff did not do anything to address the noise. “Antiquated” was my thought on this place when we saw our room, but after a room swap due to the noise outside and its loud air con, and a broken air con in the second room, the view is more just “old.” It wasn’t clean, with squidgy, disgusting slippers and smelly bathrooms. To be fair the staff were very helpful and quick in making the changes, but the general place has dated badly and it’s a little depressing. Bodega indeed. Pay what you get for, but not even that gets you much. Rooms are big and beds are okay, but the decor and room wasn't atheistically pleasing. Wifi is awful in the room, but good in the lobby. Asked for a Airport taxi for a 5pm pick up and he didn't even call the company 5, and it didn't arrive until 5:30pm. Picking at small holes here, but it's the small things that make the biggest differences. Thanks for the stay. No atmosphere but nice big room with tv and fridge! Power sockets near bed didnt work so couldn't have the lamp on or charge anything. Owners were helpful. Breakfast was okay. In the centre, good location! We chose this place mostly because we wanted somewhere within close walking distance to the train station due to a tight train/flight schedule. The place is decent, but not the nicest or the most clean. Location is good- very walkable to Hoan Kiem Lake and anywhere in the Old Quarter. I think you can find nicer hostels for the price, but it satisfied our needs. Staff is very nice and helpful and allowed us to leave our backpacks there while going to Sapa for a few days. You get what you pay for. The staff tries to do what they can, but the fact is there aren't many people staying here so atmosphere is limited and the accommodations are quite basic. No wifi in room. AC worked. Breakfast was ok but perhaps below average. This place was pretty gross, it was just very dirty, not like the pictures at all, and also there were cockroaches in my room. I left within a half hour and found a different hostel.